Hi everyone. 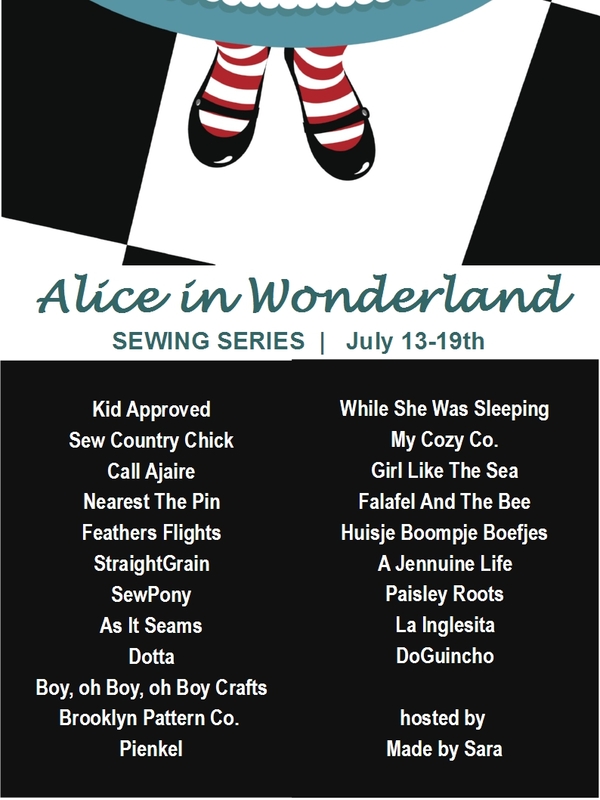 Today I am taking part in a really fun sewing series hosted by Sara from Made by Sara. It is called Alice in Wonderland and marks the 150th anniversary since the publication of the famous book by Lewis Carroll. Sara has organised a bunch of sewing bloggers to sew something inspired by the magical story. You can read Sara's introduction here. Wow - so many amazing characters and themes are contained in this story. I really struggled to narrow my idea down. I could include pink flamingoes, rabbits, cats, playing cards, a blue dress....I will admit I am not 100% familiar with the entire story but the themes and characters have been familiar since my childhood and we still have a family photo of me and my little sister dressed up as the mad hatter (me) and Alice. 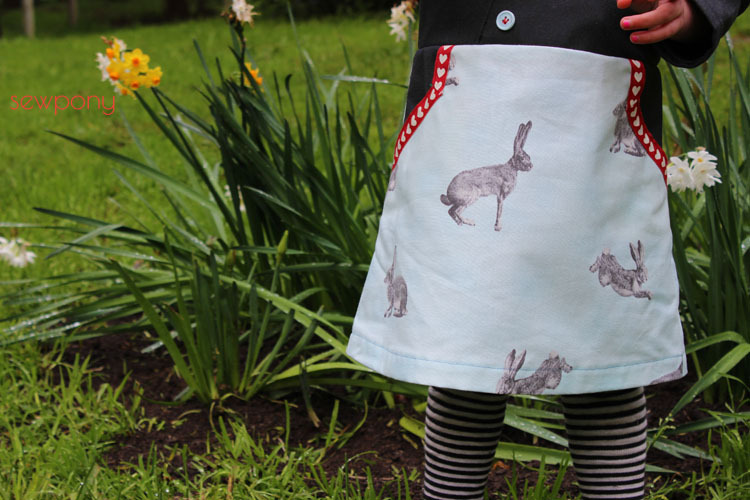 In the end, I was inspired by this gorgeous blue fabric with rabbits on it (A 'buzoku duck' fabric from Spotlight). I have always liked it and thought it would have a nice amount of stiffness to be made into a Sunday picnic dress with some charcoal suiting I had on hand. I altered the pattern slightly to allow me to successfully use the heart ribbon along the pocket edges. So I squared the edges off and turned the ribbon at the corners. I stitched three vintage blue buttons on using downward arrows inspired by going down the rabbit hole! 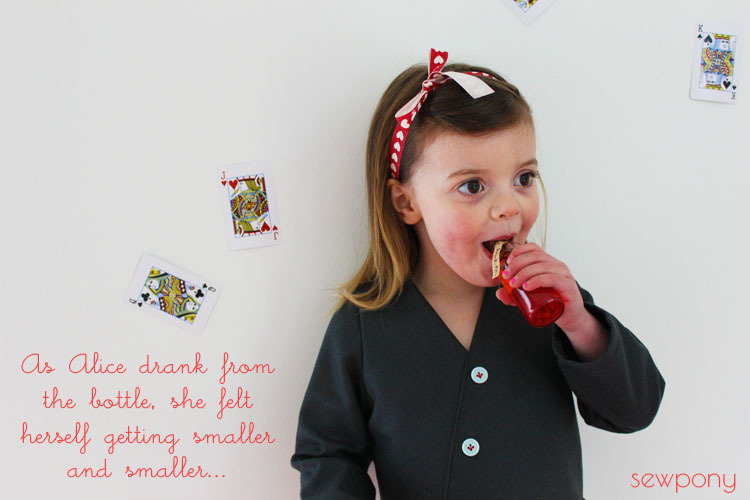 One of the themes in Alice in Wonderland is that of Alice becoming smaller and larger throughout the story after drinking a special drink with a 'drink me' tag attached, and also by eating cupcakes (I think) that say, 'eat me'. I wanted to incorporate this somehow in this photoshoot. I found a small bottle and popped some coloured water in it and Emily was very excited! After following the rabbit down the rabbit hole, Alice found herself in a room with a very small door. The rabbit jumped through, but Alice was too big to fit through the door. 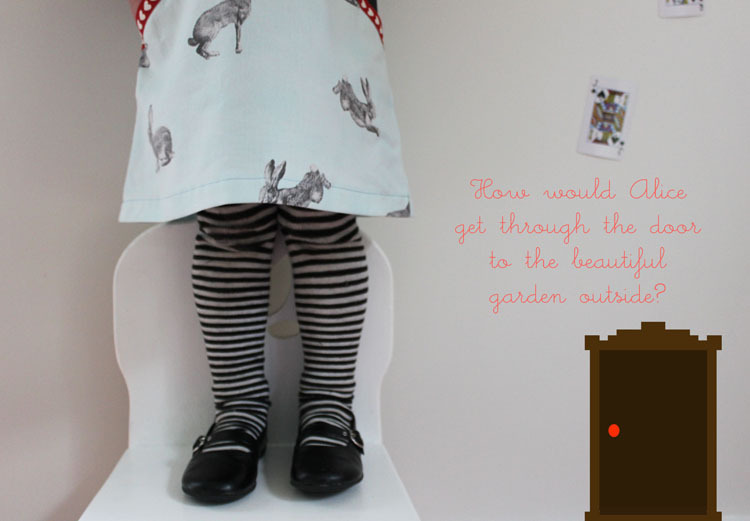 She looked longingly through the door to the beautiful garden outside and wanted to follow the rabbit. She turned her head and saw a small bottle on the table. 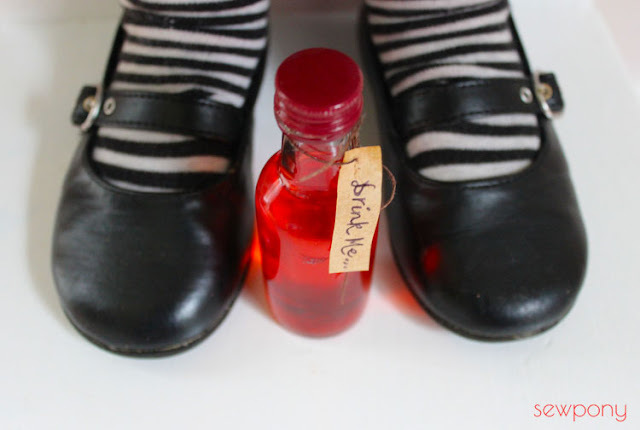 The bottle said, 'drink me'....Alice pondered the bottle. 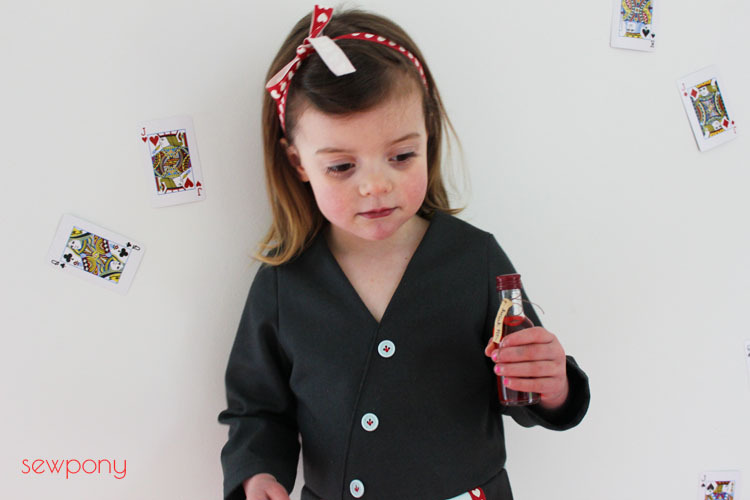 Sara has organised a great pattern giveaway too. Two winners will receive seven patterns each. Enter below if you like! Thank you so much for having me Sara! - this is a very inspiring theme and I really enjoyed creating my outfit and am enjoying seeing what other bloggers have made. 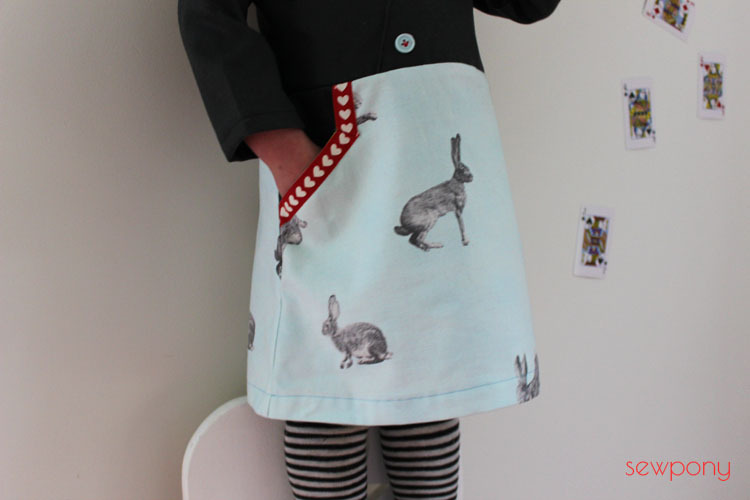 I love that rabbit fabric! Love this, Suz! 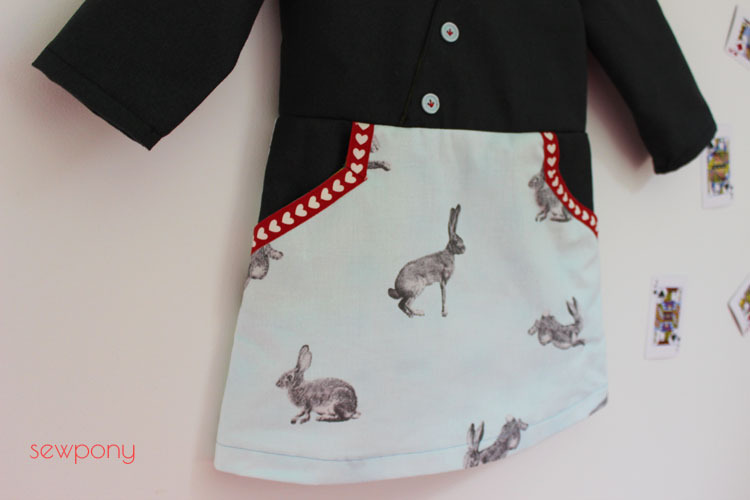 The rabbit fabric is the coolest! And what a fun photoshoot! 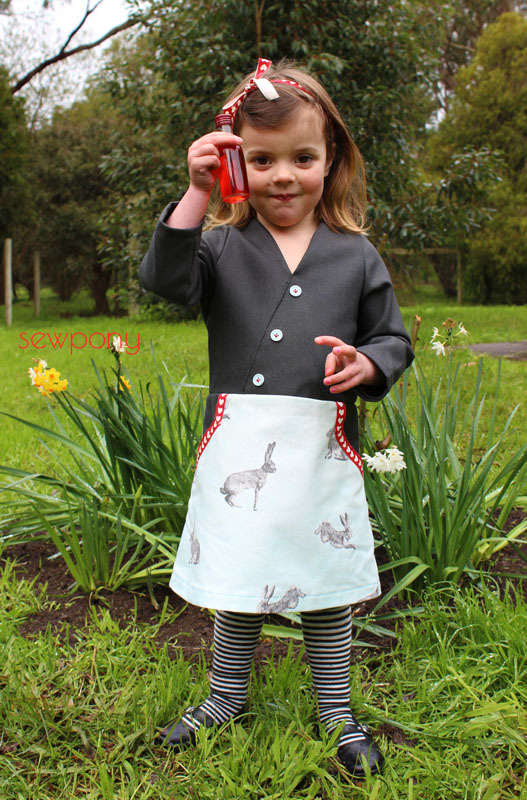 That rabbit fabric is beautiful! She's an adorable "Alice"! The rabbits are lovely! It looks so great with the charcoal and the pop of red ribbon. Very cute and a great photo shoot! You must read the unabridged book. It is an absolute gem with very clever wordplay and some delightful scenarios. My kids loved listening to it, especially my son who has learned to play Chess and appreciated the chess theme of Through the Looking Glass. If your kids aren't into it, read it for yourself! 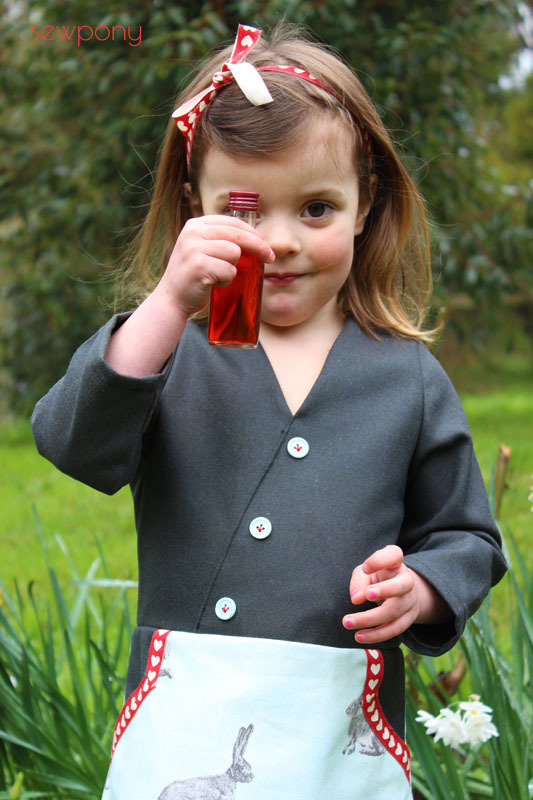 No way sweet Emily, do not let go of your red coloured drink :D The dress is a fab representation of the story Suz. Such thoughtful details!